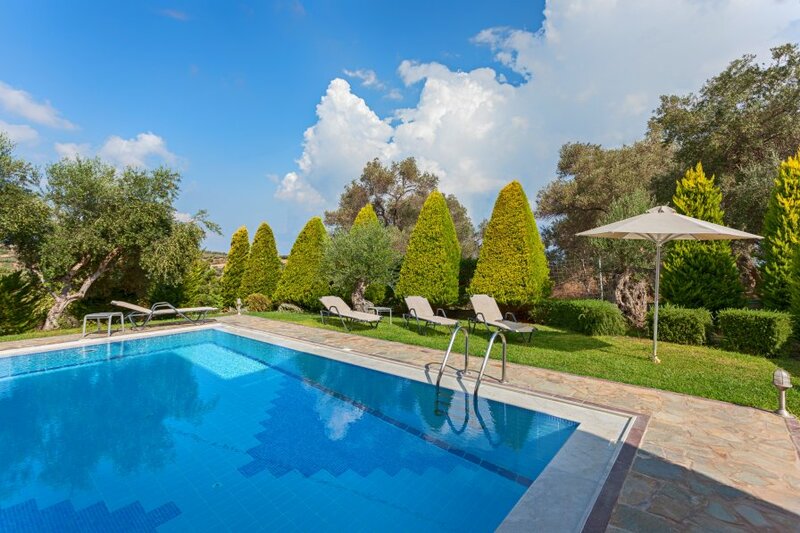 Alkyonides Villas- Villa Kiikas With Private Swimming Pool! Welcome to Villa Kiikas, one of the two Alkyonides villas in Rethymno, Crete! Alkyonides villas is a complex of 2 fully equipped villas, Villa Alkyoni and villa Kiikas, each with a private swimming pool and a BBQ, that will meet your expectations! Villa Kiikas is a beautiful four bedroom villa, which can comfortably accommodate 8 people. Built in three levels, combines simplicity with comfort. From this area you have access to the garden and the pool outside. Moreover, on this floor there is a bedroom with double bed, which splits also in two singles on demand and a shower/WC. Outside the villa offers privacy among delightful illuminated, landscaped gardens with aromatic herbs and convenient areas for lazy cocktails and/or dining. The villa has a private swimming pool for children and grown-ups and also a BBQ area where you can enjoy your lunch, dinner or a drink under the candle light or just the starlight.